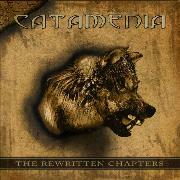 CATAMENIA was founded back in 1995 by long-serving guitarist Riku Hopeakoski (and Mika Tönning, who left in 2003). Most of the band was replaced around 2010, apart from quite faithful bass player Miko Hepo-oja who has been in the band twice. Ten albums including this, which is a rerecorded best of, so we better say nine and a best of. The band has a loyal following, so I hope they stay loyal after this. The epic Finnish style that is almost omnipresent is probably a wise choice. Dealing in highly melodic black metal the band has a fine sense of arrangements and their national folk music. The mix of heavy metal and black metal is delicate to me, but maybe not to others. The likes of “Blackmension”, “Alive…Cold…Dead”, “Post Mortem” and the absolute bullseye of “The Day when the Sun Faded Away” and “Pimeä Yö” are highly convincing. But when they get hysterical or too blackish, as in “Morning Crimson, “Eskhata” and “Kuolon Tanssi” they are far below their abilities. To end things with a sense of humor they do a version of BON JOVI´s “Born to Be My Baby”, which is a fine way of letting out steam. Not bad at all, Finland is more than AMORPHIS!